For February 22, our forensic accounting needle in a haystack comes from a peer-to-peer lender that knowingly uses misleading non-GAAP metrics. Analyst Peter Apockotos found an unusual item in Lending Club’s (LC) 2018 10-K. It excludes costs that are recurring expenses for the company. Other companies in the industry calculate the metric differently, so investors cannot make accurate comparisons. It does not account for the dilutive impact of stock-based compensation. Even though depreciation and amortization are non-cash charges, the company has to spend cash to replace the depreciating capital. Adjusted EBITDA does not reflect the tax payments that reduce cash flows to investors. 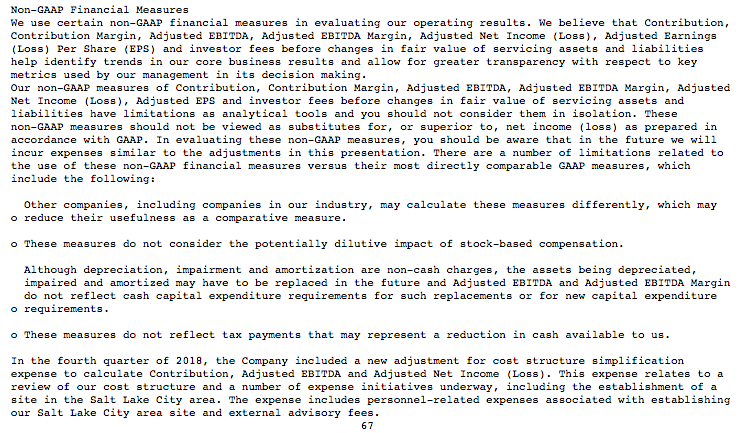 Why, if Adjusted EBITDA is flawed in all these ways, does LC continue to highlight it in their earnings reports and use it as the primary driver of executive compensation? For the same reason that previous Danger Zone picks such as Snap (SNAP), TrueCar (TRUE), and Newell Brands (NWL) did: Adjusted EBITDA allows the company to present itself as profitable and lets executives keep earning bonuses even as they destroy shareholder value. LC claims that it earned $98 million in adjusted EBITDA in 2018, but when we look at net operating profit after tax (NOPAT), we see that LC actually lost $18 million.